Patch Panel, SC Duplex Loaded 24W. You do not have to give any reason for cancellation. ASIS Also known as "spares or repair". Hard Drives. 2U Blank Panel; cabinet accessory for the Connectix 8U Office System Wall Cabinets. Body Colour: Black. During that process you will be issued with an RMA number. PATCH PANEL,24 WAY UNLOADED,SHIELDED Connector Type: - LAN Category: - No. Give us a shot and we will make sure that you will look to us again! You're already purchasing the item. UK Safetfy Spec. Quality Products. 24 Way Cat5e patch panel with high density format, suitable for Gigabit Ethernet applications. LAN Category: Cat5e. Individual labels colour coded to T568B. Robust steel construction with black powder finish. Connectix Cat5e 24 Port, 1U Patch Panel. The price is for 1 panel. Condition is Used. Please see photos or message for any questions. Dispatched with Royal Mail 1st Class. LAN Category: Cat5e. Product Range: -. of Ports: 12. Connector Type: RJ45. 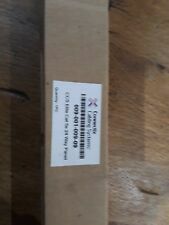 24 Way Cat5e Patch panel - Connectix CCS Elite Condition is New. Dispatched with Royal Mail 1st Class. 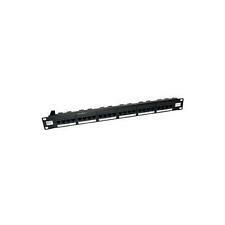 Connectix Cat 5e 24 Port UTP HD 19" Rack mount Patch panel 009-001-004-20 . Condition is New. Dispatched with Royal Mail 2nd Class. Clean condition, as new ! In good conditions and full working order. Connectix CCS Cat 5e 2020 24 Way UTP RJ45 Panel. Condition is New. Dispatched with Royal Mail 2nd Class. 1U Blank Panel; cabinet accessory for the Connectix 8U Office System Wall Cabinets. Body Colour: Black. During that process you will be issued with an RMA number. Of Ports:24Ports, Product Range, Rack U Height . Manufacturer Part No:00A-013-000-43. Of Ports:24Ports, Product Range, Rack U Height . Manufacturer Part No:00A-013-000-42. Enhanced NET 5 16WAY UTP RJ45 PANEL. CCS CAT 5E HD 48WAY UTP RJ45 PANEL. Patch Panel, 24W Ftp, Cat6A 2020 1U, Connector Type:Rj45, Lan Category:Cat6A, No. Of Ports:24Ports, Product Range:2020 Series. Type:Patch Panel 24W Ftp Cat6A 2020 1U. Manufacturer Part No:009-002-001-40. Panel, Through Coupler, 24 Way Cat6, Connector Type:Rj45, Lan Category:Cat6, No. Of Ports:24Ports, Product Range:Ccs Elite. Type:Panel Through Coupler 24 Way Cat6. Material:Made from High Quality. Fibre Patch Panel, 24W St Loaded M/Mode, Connector Type:St Fibre Optic, Lan Category, No. Of Ports:24Ports, Product Range:Optix. Type:Fibre Patch Panel 24W St Loaded M/Mode. Manufacturer Part No:009-022-009-24.